A refreshing and appetizing salad drizzled with a slightly sweet savory sauce. It takes only 15 minutes to get ready, loaded with nutritions and is low in calories. The holiday is coming to an end and the new year has just started. If you’re planning to start a healthy diet and give your stomach a break, you’ve come to the right place! Chinese cold dishes, or appetizers, are a hidden treasure waiting to be discovered. 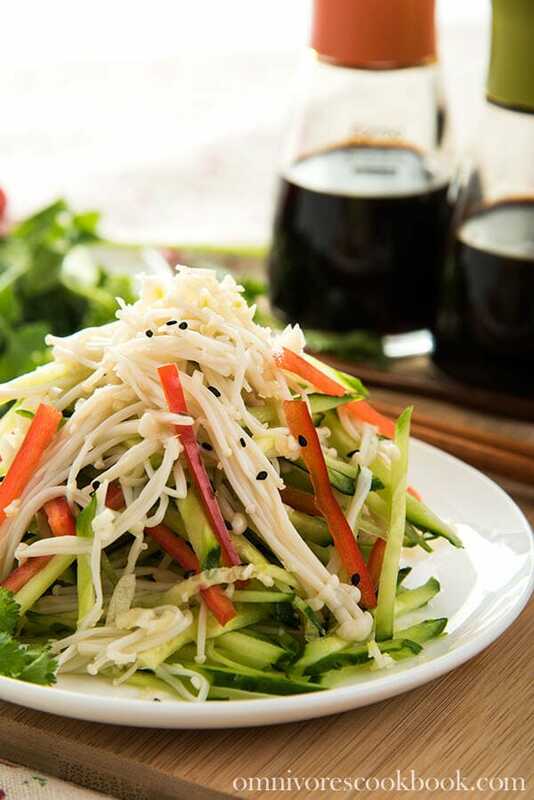 You might have never seen a big collection of appetizers or salad dishes at overseas Chinese restaurants. But if you ever come to China, you might be surprised at the endlessly long list of cold dishes. It’s common practice for an average restaurant to serve more than 30 types of appetizer. Even a small bistro that only serves a standard set menu (which costs less than 3 dollars for a whole meal) will still have 10 appetizers on their small paper menu. Cold dishes in China are like meze in Turkey; they come in a wide variety and consist of simple and delicious items. 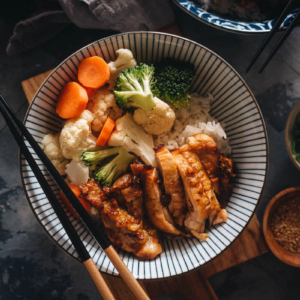 Although there are various meat dishes among Chinese appetizers, including chashu and sausage, most cold dishes are vegetarian or vegan dishes. 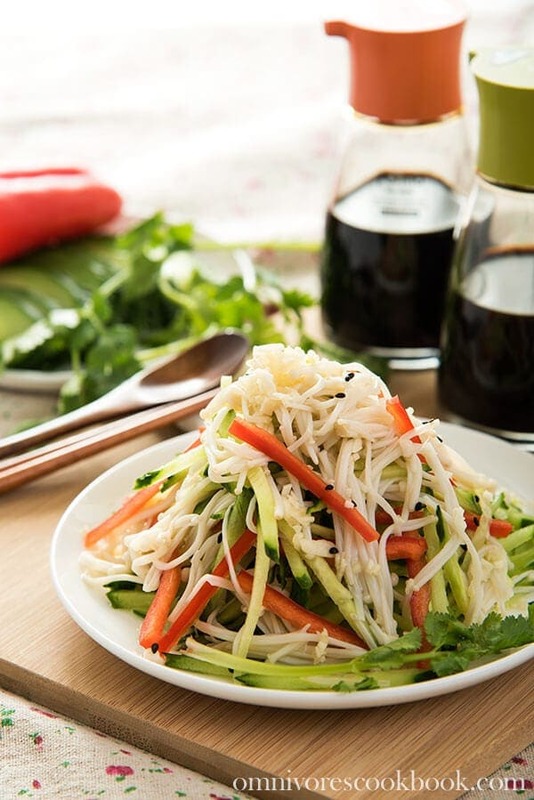 In Chinese style salads, the veggies are usually drizzled with a simple soy sauce or vinegar-based sauce, and are mixed with fresh herbs such as garlic, ginger, and green onion. This golden needle mushroom (also called enoki mushroom) dish falls into the same genre. The mushrooms are slightly blanched to get a crunchy yet soft texture. 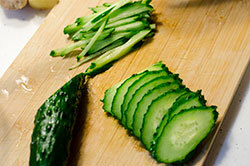 Some cucumber and pepper are added, to lend some color and a crispy and moist texture. The sauce is light but flavorful. 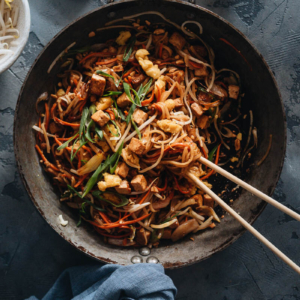 The soy sauce, sugar, sesame oil, and garlic work well together to create a slightly sweet and savory taste that goes great with the mushrooms and veggies. Golden needle mushroom salad is a super healthy and refreshing cold dish that can be whipped up in under 15 minutes. 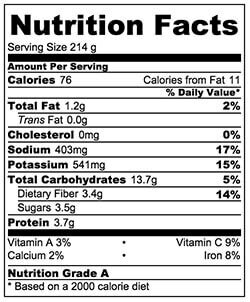 If you look at the nutrition facts below, you’ll see it’s rated as grade A. It has a super long list of health benefits, including being low in fat, cholesterol-free, high in dietary fiber, iron, potassium, and various vitamins. The beauty of the cold dish is that it takes almost no time to prepare and contains a good amount of veggies. It’s one of the best ways to add vitamins and fiber to your daily meal without adding many calories. The most important point, they are super delicious, too! Next week, I’m teaming up with a few bloggers to publish a healthy recipe roundup. Don’t forget to come back then for more delicious and healthy recipes! Bring a medium-sized pot of water to a boil. 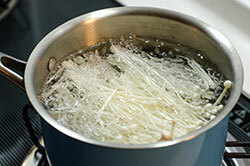 Add golden needle mushrooms and cook over medium heat for 1 minute, until the mushrooms are just cooked through. Transfer mushrooms to a colander and run tap water over them to stop cooking. Drain and set aside. 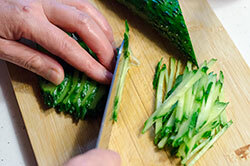 Prepare the rest of the vegetables. Combine mushrooms, cucumber, jalapeno, and garlic in a bowl. 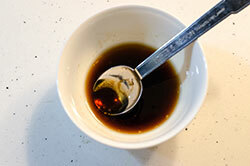 Mix light soy sauce, sugar, salt, and sesame oil in a small bowl. Right before serving, pour sauce over the salad and mix well. Serve immediately as a side or an appetizer. The nutrition facts are calculated based on 1 of the 3 servings generated by this recipe. I love this fresh and healthy salad! Love salads after the holidays! I’m a huge fan of mushrooms and will have to try something similar, never had golden needle mushrooms though. Love the simple sauce! Pinned! I’ve been looking for a light dish for lunches and I think I’ve found it. Can’t wait to try this. 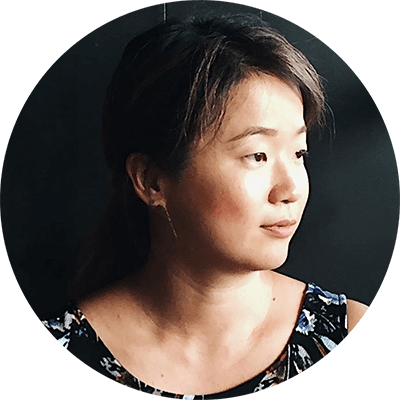 I learn something new every time I visit your blog, Maggie! I have been to China (in 2008 … I was there for just one week but absolutely loved it!) but I didn’t discover these cold appetizers … what a shame! Just means I will have to go back some day! I love that this salad is unusual and yet still very easy to make. Would love to try this if I can find some of those mushrooms! I can’t wait to try this beautiful refreshing salad! After all of the food I’ve eaten this holiday season, I could sure use a big bowl of this! This looks delicious! The golden needle mushroom look like enoki mushrooms – are they the same thing, just different name? Yep, they are anoki mushrooms. The name of “golden needle” is directly translated from Chinese and I forgot to mentioned the other name more commonly used name! Thanks for reminding me! I’m pretty sure these are the same as enoki mushrooms and I had them for the first time last summer – fabulous! Such a wonderfully, refreshing salad Maggie. I’ll be making it tonight and bringing it to the office for everyone for lunch tomorrow. Like Helen, I learn something new every time I come to your blog. Love it! 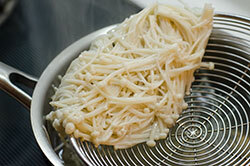 These are indeed enoki mushrooms! Thanks for reminding me and I will add the alternative name into the recipe. If you are going to serve the salad the next day, don’t forget to save the sauce separately and mix them together before serving. Happy cooking! That salad looks delicious– I love the simplicity of the dressing. 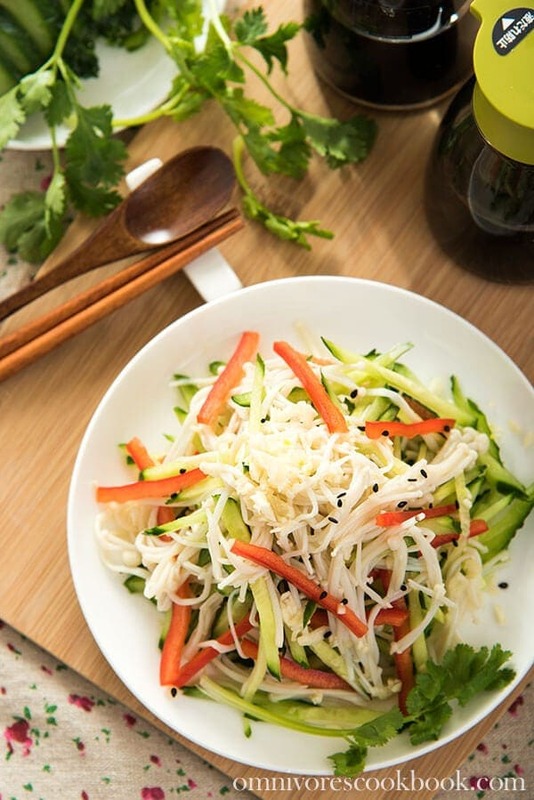 Perfect for detoxing after the holidays and lightening up some meals. You have a knack for making me want to drop what I’m doing and come right over to check out your recipes! The title really caught my eye. Golden needle? Enoki mushrooms! I had no idea! Just what I needed Maggie! This year I’m determined to include more salads into my diet, and it’s sometimes a little tough to find interesting ones. 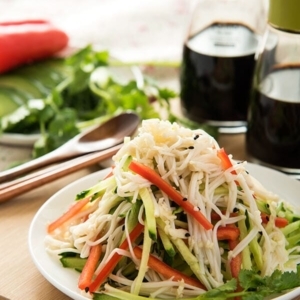 This one looks simple, quick, and very tasty. Plus, I’m like obsessed with mushrooms…love it! 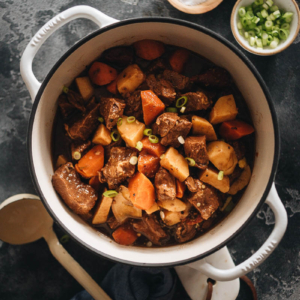 I lived in China for 3 years and this was one of my favourite dishes….amongst many others ;)…..I can’t wait to make this. As soon as I saw it I salivated. Yayyyyyy! Made this for work tomorrow and I tried some after I made it. THIS IS DELICIOUS! I was skeptical about adding sugar to soy sauce but it works. I cannot wait to try other recipes from this site. hi, i’m from cnv mushroom farm, during the research, i accidentally found this article on how to process “Golden Needle Mushroom”, the article is very wonderful. More information for some of you do not know: The needle “Golden Needle Mushroom” has 2 types of white and yellow, nutritional value is equivalent.